In Valdepajares de Tajo environmental education activities are developed for every kind of organization and association, from schools to groups of young nature lovers. For each group, activities are designed and adapted to the age of the children. The objective of these programs is to show children the importance of the environment they are a part of: the pastureland, at the same time they are provided with tools to protect and improve it. Using activities where teenagers and children have fun, they learn the characteristics and problems present in the environment and how they can help to care for it. 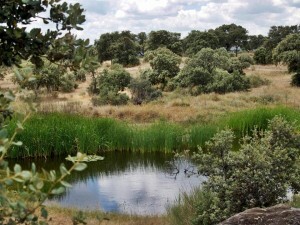 Valdepajares de Tajo has the advantage of having an amplified representation of all these ecosystems in a space which is cared for perfectly: the pastureland zone occupies a large part of the estate, where activities regarding environmental education can take place, under the supervision of monitors at every moment. Furthermore, the estate has ponds where activities related to the aquatic environment be conducted. This is of vital importance in Extremadura. Children and teenagers are offered tools to improve their environment and feel curious about protecting it, at the same time they are conscious of the responsibility of living in an environment like the pastureland; always in a fun way. These activities are arranged for the different seasons of the year, like this, the children are conscious of the changes occurring in the pastureland and the distinct ecosystems that form a part of the territory they live in. In the ‘News’ section we provide information regarding the courses given throughout the year. (This section is available only in Spanish, but you can translate it into your language activating your browser´s translation tool).